Published: Nov. 21, 2017 at 12:38 p.m. 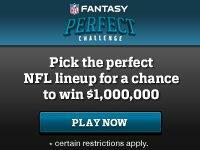 Updated: Nov. 21, 2017 at 12:51 p.m.
Below are the Perfect Challenge picks for Week 12 from The NFL Fantasy Stronghold. Russell Wilson is playing good football this year. The 49ers defense is not. Le'Veon Bell and Antonio Brown get to take their turn running through the Packers beleaguered defense. LeSean McCoy is about the only thing the Bills have going for them. He should see the ball plenty. Brandin Cooks and Rob Gronkowski should have their way with the cadaverous Dolphins defense. The Ravens defense has been playing good football this year. The Tom Savage-led Texans offense is not. And Wil Lutz. Russell Wilson is back, guys. This is the week that Kareem Hunt gets off the schneid. Like for real, for real. Todd Gurley should just keep rolling, even against the Saints improved defense. Antonio Brown ... hi! Stefon Diggs is due for a blow-up game soon. The Lions seem like a good foil on Thanksgiving. Gronk's gonna Gronk. Gelhar is resigned to the Steelers defense picking apart his Packers. And Justin Tucker. Harmon won't be a sheep and go with Russell Wilson. Instead, he'll bank on Kirk Cousins in primetime against a division rival. 'Sup, Todd Gurley? Howdy, LeSean McCoy. Harmon is hoping bunches of Devin Funchess will pay off yet again. We'll see if this week T.Y. Hilton is closer to his high ceiling or super low floor. Vernon Davis against the Giants makes far too much sense. The Jaguars get to tee off on their former quarterback Blaine Gabbert. And Harrison Butker. Hola, Russell Wilson! Come on down, Kareem Hunt. Mark Ingram should stay hot and put up a big number against the Rams run defense ... unless, of course, it's Alvin Kamara. Howdy, Antonio Brown. Keenan Allen is a target monster which won't change this week against a less-than-great Cowboys secondary. Vernon Davis is chillin'. Sacksonville is still lurking. And Chris Boswell. Those are our picks for Week 12. Hit us up on Twitter with your lineup. Enjoy the games!